Kongstruction is the third Funky's Flights mission in the Game Boy Advance port of Donkey Kong Country 2. It can be played in Krem Quay. This mission involves Diddy Kong rebuilding a Donkey Kong statue. The final Funky's Flights mission, Toxic Kongstruction, is a sequel to this mission. In this mission, Diddy must find all the parts of the Donkey Kong statue and rebuild it in the middle of the area. There are five statue parts: legs, torso, left arm, right arm, and head. Diddy must use the Gyrocopter's winch to grab the parts. However, Flitters will steal the statue parts and carry them around, so Diddy must shoot the Flitters to get rid of them. This mission contains green boxes with wrenches on them that will repair any damage done to the Gyrocopter; ammo boxes are absent, as the Gyrocopter has infinite ammo in this mission. A single time-increasing clock that adds 10 seconds to the timer can be found to the right of where the statue's head is located. When Diddy Kong finishes rebuilding the statue, it glows yellow and the Flitters can not steal the parts anymore. 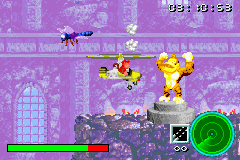 After the statue is rebuilt, Diddy has to land back at the helipad to complete the mission. "Back again? This mission is quite tricky. The Kremlings have destroyed the DK statue. Find the pieces and reconstruct it. To hook a statue piece, press SELECT to release the winch. Pressing SELECT again will drop off anything on the rope. One more thing. Keep a close eye on any statue pieces rebuilt, as they might go missing. You have five minutes of fuel, so get going." "Wow! You sure know how to handle that old bird. Here is your reward." This page was last edited on November 6, 2018, at 00:17.